Graham Toward lives near Berwick on Tweed, and has spent the last few years researching builders of fishing vessels between Berwick and Aberdeen, an ongoing project. He is a member of the Coble and Keelboat Society and is the Scottish East Coast rep for the 40+ Fishing Boat Association. He also writes occasional articles for Fishing News. This shipbuilding firm started up at Leith in the March of 1875, with a capital of one hundred pounds and specialized in wooden hulled vessels, powered by steam. It is claimed that they built the world’s first screw-propelled steam trawler in 1877, although it is difficult to be one hundred per cent certain on this claim. The 1877 vessel was wooden hulled, and named Pioneer LH854. As well as the steam engine, Pioneer had two masts and carried a full set of sails. Whilst Leith registered and owned, Pioneer seems to have been worked by a Shetland crew, alternating between trawling and long-line fishing, but also carrying seven herring drift nets. These were presumably only used to catch bait for the long-lines. Pioneer seems to have led a short but eventful life. Various mentions of Pioneer are recorded in the Shetland Times of that period. 4th May, 1877. Sandwick Parish. S.S. Pioneer- After the outlay and risk of life which has attended the placing of this boat on the Shetland fishing, it was gratifying to see her yesterday (Wednesday) steaming up the bay leading to Hoswick, in order to take in some fishing materials. She is now fairly underway for the fishing, with a good crew who know the fish banks well, more particularly upon the West side of the Islands. It is many years since we first thought of getting steamboats on the Shetland fishing, and we are as confident as we ever were that if it is properly managed it is sure to be a success. In the event of the Pioneer doing well this season we have good reasons for saying that Leith boats of the same description will be sent to Shetland to be manned by Shetland men, and that a large number of our Shetland fishermen now in the South otherwise employed will find their way back to fatherland, and engage in the new mode of fishing. It does not matter whether the boats be sent by companies or individuals. Agents will be appointed to manage and give the men all the encouragement possible, and so a new era in Shetland fishing will be noted as a step in advance for Shetland fishermen. It will demand of them prompt and careful attention, and all of them, especially the young, should endeavour to get a knowledge of engineering, and so be ready to assist in that department, or, it may be, to take management. 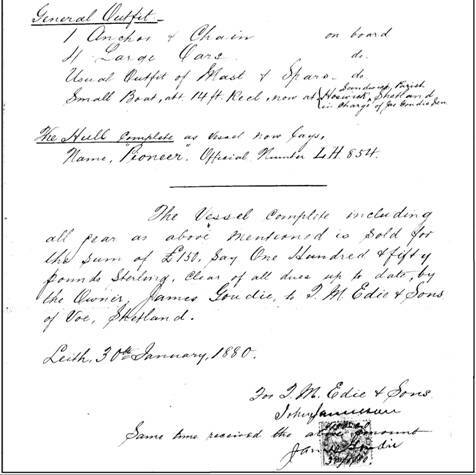 2nd February, 1878. Sandwick Parish. The spring fishing begins to engage the attention of the fishermen, though as regards some of them, it is difficult to leave their work on the crofts. One of our sailor men who happens to be at home just now seems to think well of the idea of using steam on the long line fishing, and has taken charge of the Pioneer, which is now being made ready for a new start. He has a good knowledge of the fishing, is an experienced sailor,, and being a navigator as well, and with an engineer to go along with him, we think that men of the right stamp need not hesitate to give the new mode of fishing a fair trial, as has been remarked by the man who has taken charge. We cannot see but a large fishing will be made. 16th March, 1878. Sandwick Parish. This morning (Thursday) is so calm that the sea stretches out to the horizon like a sheet of glass, and hopes are entertained that the Pioneer will be got afloat. Every attention has been given to get the boat suitable for fishing, and from first to last the expense has been considerable, we should say nearer a thousand pounds than the six hundred, as has been stated, and there are more sufferers in connection with the loss than one individual. 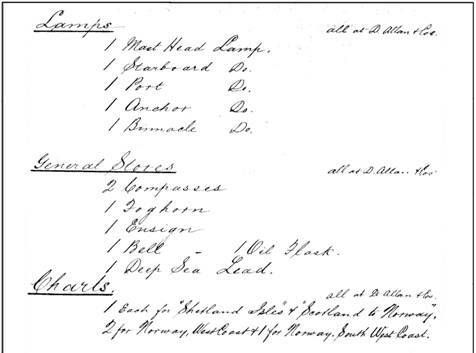 The cause of the accident was the want of enough steam to make the boat go ahead when she missed stays on a lee shore, but we understand that no claim can be attached to the engineer who, we are told by one of the crew, had the engine in the best of order, and only waited instructions as to the quantity of steam to have at command. This is a great blow struck against the enterprise in Shetland, but we still have faith in it’s ultimate success and that all that is wanted is good management. 27th April, 1878. Sandwick Parish. S.S. Pioneer of Leith. We were credibly informed that at the time she stranded one of the men got his foot injured, another lost his sea clothes, and that all the men more or less sustained loss by being so suddenly deprived of employment. As regards the losses connected with her previous history, we think it best for parties concerned to say no more about it. 20th July, 1878. Sandwick Parish. Some fishermen say that there appears to be no herrings on the coast, and that without this kind of bait there is little use of laying lines. We noticed the S.S. Pioneer a few days ago as she was leaving for Leith. There was little or no wind, the sea was smooth, but shortly it got up from about North, blowing rather a stiff breeze, and we doubt not she would have fine passage. Her history is a strange one, and would form a very readable book. She is rightly named Pioneer. It is likely that a larger steamer will be put on the long line fishing on the coast of Shetland next year, and that if she succeeds more will follow. 6th March, 1880. Sandwick Parish. The news of the wreck of the Pioneer on the West side of the Islands gives occasion for much talk, and her history, connected with strange incidents as it is, would form an interesting tale. 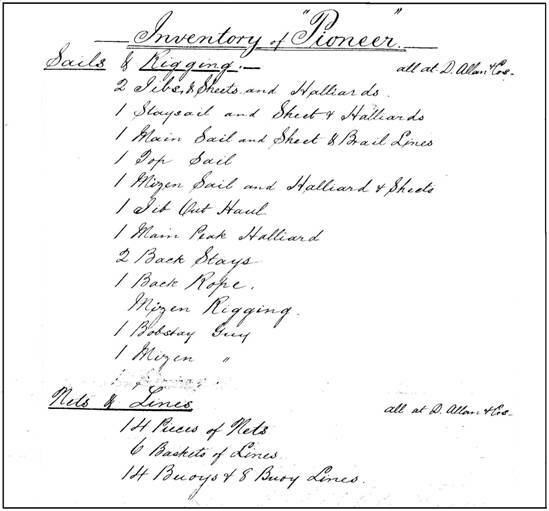 The first part of the inventory of Pioneer in January,1880, continued on the next page. From the above, it would appear that Pioneer arrived at Shetland in the spring of 1877. The boat then ran aground in March of 1878, was refloated and then returned to Leith in July of that year, possibly for repairs. In January of 1880, Pioneer was sold to T. Adie of Voe, Shetland Isles for what seems an incredibly small sum of one hundred and fifty pounds, which included the fishing gear, and by March of that year the boat was lying wrecked to the West of the Shetland Isles. Not a great success story, but presumably between the incidents there were some periods of reasonable fishing. It is also interesting to note that the inventory records that the boat carried Norwegian charts, although it cannot be ascertained whether Pioneer ever fished those grounds. Whilst others had possibly experimented earlier with steam trawling, these experiments had usually involved a converted vessel such as a steam paddle tug, rather than a purpose built trawler such as Pioneer. The type of trawling undertaken by these early steam boats, including Pioneer, was beam trawling rather than otter board trawling, with a single beam trawl being towed astern. However, most of Pioneer’s work seems to have been long-lining rather than trawling. What can be said with a fair amount of certainty is that the Allen yard went on to achieve a first by building two screw driven steam drifters in 1878. These were basically wooden “fifie” hulls of around fifty six feet, fitted with upright boilers and twin cylinder compound engines. As well as the engines, the boats carried a full set of sails. No further description can be found, but it is presumed that these early steam vessels would be without a wheelhouse, steered by either a wheel or tiller from an aft position, and the only visible difference from a sailing “fifie” drifter would be the narrow funnel forward of the mizzen mast. The sail rig would most likely be of the “dandy” type, which had no spars close to the working area on deck. As well as herring drifting, these two boats also worked great-lines out with the herring season. This pair were Forward LH889 and Onward LH880 (another source names Forward as Advance LH889). Onward was built for Wm. Gunn & Co. of Granton, and it is likely, but not certain that he also owned Forward. The boats were engaged to supply herring into Aberdeen to the fish-curing firms of James Methven of Leith and Sharp and Murray of Cellardyke. The following is from an article in Fishing News 4th June, 1914. “The question of the application of the steam vessel to the pursuit of the herring fishing and the development of the steam drifter has recently been commanding the attention of several writers and it appears that none of the persons dealing with the matter has given a full account of the history of that craft. That, I do intend to aim at here, but would like to connect a few lines in the chain that appear to be wanting, and to show that steam was successfully applied to herring 36 years ago. Forward was sold to Aberdeen in 1879, whilst by 1889, Onward was owned by the Forth Steam Fishing Company. Whilst Forward’s eventual fate is unknown, Onward suffered a boiler explosion in 1898 and was broken up afterwards. Another 1878 build was Restless Wave GN7 for Muirheads Trawlers of Edinburgh, fitted with a sixteen h.p. steam engine. Restless Wave sank in the Firth of Forth in 1889 due to a fractured inlet valve. 1880 saw a build for France named Couriers des Isles D’hyeres, which was to be used as a river mail service. In a similar vein was Sea Queen, built for the West Indies, also as a mail boat. 1880 was also the year that the trawler Kingfisher GN3 was built, registered in David Allan‘s own name when new, but being sold to Naples owners later that year. Another build for Naples trawling in that year was L’Isolano. These two vessels would most likely have been Italy’s first steam trawlers. In the year 1881 came a steam trawler for local owners, Sea King GN1, built for William Gunn and Company of Edinburgh. Sea King was ninety feet in length and was propelled by a thirty six h.p. engine, which was supplied by another Leith shipbuilder, Hawthorns. This boat was unfortunately lost to a fire whilst beached at Granton Harbour for maintenance work in 1887. By 1881, the firm was also building vessels for Spanish owners, Sociedad de Pesquerias Canario Africanas, one of these being Perez Gallego, which left Leith on the twenty second of July 1881 bound for the Canary Isles. A Captain Ripoli had come across to Britain looking for the most suitable boats for their purpose, and had decided upon the Allan design. The company had exhibited at the 1881 Great Fisheries Exhibition in Norwich, this possibly being where Captain Ripoli had come across them. In May of 1881 the firm took on a second yard in Caroline Park, Granton, just to the West of Granton Harbour. The first vessel built there was also for the same Spanish company, and named the Viera y Clavijo. Unusually, this seventy foot trawler was equipped with sails only, although provision had been made to allow for the retrospective fitting of a steam engine. However, it is not known if an engine was fitted before the boat left for Spain. At the launch reception, the Spanish consul, Mr. Ressich, said that this boat was one of a fleet of trawlers built for Spain by Allan's and that they had “effected a revolution in the fishing industry of Spain”. At the time of the launching, another vessel for the same company was under construction in the yard alongside one for the Forth Trawling Company. 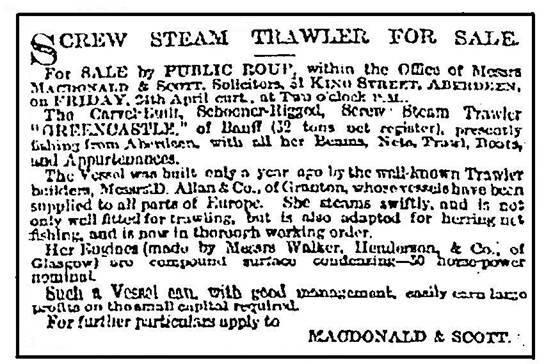 “Messrs Allan and Co., of Leith, who may be said to be the inventors of this class of vessel (screw steam trawlers). The first steam trawling vessel of the kind, the Pioneer, was launched in 1877, and since this date fourteen vessels of a similar construction have been launched. These trawlers have quite revolutionized the fishing industry, and have financially proved most successful”. However, this success was short-lived, as by December of the year both of the yards were up for sale and the firm was in receivership. This had been brought about when they had bought machinery for a trawler, with the machinery turning out to be faulty. This left Allan's out of pocket to the sum of fifteen hundred pounds. To make matters worse, the machinery supplier had gone out of business, leaving no chance of the money being repaid. The matter was resolved by the sale of the Leith yard to another shipbuilding firm, Ramage and Ferguson. New partners were also brought into the Allan business, in the shape of Mr. James Muirhead, a local trawler owner, and Mr. Hutson, the owner of a Glasgow engineering firm. 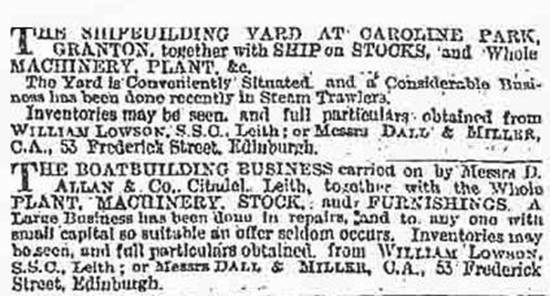 An advertisement from the Scotsman with the yards for sale. With better times looking to be on the horizon, 1882 saw the building of three more vessels for the Spanish fleet, Mamelena, Mamelena II and Mamelena III. This latter vessel was Allen’s nineteenth trawler, six of which had been built for Spain, and was the third to be built for Mercader and Sons of San Sebastian. Launched on the sixth of April by Miss Muirhead, Mamelena III was towed to a berth in the harbour for the fitting of a thirty h.p. engine which had been supplied by Walker, Henderson and Company of Glasgow. This gave a speed on trials of over ten knots, which could be increased by the raising of the auxiliary sails if wind conditions were suitable. The hull of the boat was ninety two feet in length with a beam of eighteen and a half feet and constructed of pitch pine planking mounted on oak frames, and was designed to tow a beam trawl of fifty feet in width. Mamelena III was built to a design which Allan's had displayed at the 1882 International Fisheries Exhibition and that design had been awarded a gold medal. It was a fitting triumph for them as that year’s exhibition was held in Edinburgh. Two more trawlers for Spain in 1882 were Elcano and Erquicia. Another build in 1882 was Kingfisher GN4, which was built to the same specification as Mamelena III, with the thirty h.p. engine being supplied by Ross and Duncan of Glasgow. Launched on the twenty fifth of September, this vessel was registered in David Allan’s own name. Presumably he intended to diversify into trawler ownership to add another string to his bow. By 1900, Kingfisher was owned by Newhaven Trawlers Ltd., and moved on to Alex. Robb of Torry, Aberdeen in 1916 becoming Kingfisher A613. After moving to other Aberdeen owners, Kingfisher sank in Oban Bay in April of 1924. An advertisement from the Edinburgh Fisheries Exhibition catalogue of 1882. “It is seven years past since Mr. Allan pointed out to me the propriety of using steam, and I now can see that if we wish to keep pace with the expedious modes of fishing and bring our fish in in time for markets, then the use of sailing craft must eventually give place to steam”. However, by the end of that year, Isabella had been sold to San Sebastian, Spain, joining the other Allan builds in that fleet. In May of 1883 came the launching of Gannet GN15, the yard’s largest built to date with a length of one hundred and two feet and a beam of eighteen. Gannet was a dual purpose vessel, capable of either trawling or drift-netting. Built to fish further a field and equipped with refrigeration equipment, Gannet was designed to work longer trips of up to two weeks at sea. After the launch Gannet was towed to Leith where a thirty five h.p engine was installed by the firm of J. Cran and Company. 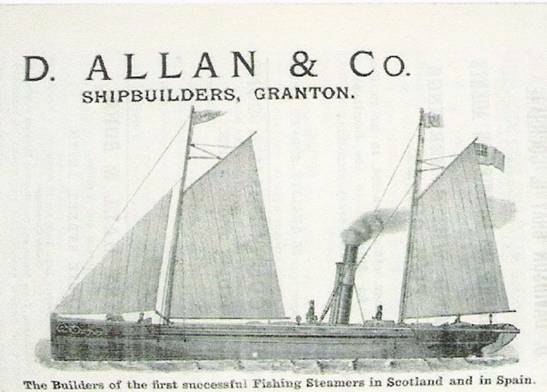 Gannet was built for Muirheads Trawlers, the owner of which, James Muirhead, was a partner in the Allan yard. At this time Mr. Muirhead was retiring from the Allen business, presumably to concentrate on his trawling business. After a successful fishing career, Gannet was wrecked in the Orkneys in 1893. Later that year came Caller Ou (a local saying meaning fresh oysters), another of the ninety two foot design with a thirty h.p. engine by Walker, Henderson and Company of Glasgow. Launched on the eighteenth of October for the consortium of Bentley, Burtley and Macleod of Edinburgh, this boat worked from Granton until 1885. At that time the boat was sold to Mercader and Sons of San Sebastian. It seems that the Spanish were keen to get as many of Allan’s trawlers as possible. The Allen firm exhibited at their third International Fisheries Exhibition in 1883, held in London this year. They again were awarded a gold medal for their steam trawler design. Launched in 1884, Greencastle BF1356 was built as a steam herring drifter as well as a trawler. Built for James Wood of Portknockie as the first steam fishing vessel in Banff shire, Greencastle was named after a promontory fort near Portknockie. The hull dimensions were ninety feet in length with a beam of eighteen feet. The Glasgow firm, Walker, Henderson and Company supplied the thirty h.p. engine. However, Greencastle was not a great success as a drifter. This was because the boat was fitted with an early (and probably experimental) steam capstan for net hauling. It was placed to haul the nets over the stern, with the result that they often became caught on the propeller. By the 1890s, steam drifters had their capstans placed forward and hauled their nets from the fore end of the boat. Because of this problem, Greencastle was sold on at the end of the first fishing season. New owners, the Lowestoft Steam Carrying Company, registered Greencastle as LT101 and used the boat for both beam trawling and as a fish carrier, working between the trawling fleet and Billingsgate Market in London. At the end of her fishing career in 1899, Greencastle was sold to the Western Marine Salvage Company of Penzance, presumably as a work-boat as this company still owned Greencastle in 1925. Incidentally, Greencastle’s yard number is recorded as eighty three, which means that Allen's must have been averaging eight builds per year over their first decade. However, this total probably includes a lot of smaller wooden sailing craft as well as the steam vessels. The auction sale notice for "Greencastle". Another 1884 build was "Juliette Marie", a large trawler of one hundred and five feet in length and twenty one feet in the beam. Launched in the September of that year, this steam trawler was destined for a Dunkirk owner, Mr. A. Sevestre, and was fitted with a fifty h.p Walker Henderson power unit. Steam trawlers for another European country came in 1884 with the launching of Prima for Ostend, Belgian owners. This was followed in 1885 by Secunda and Tertia for the same owner. The following year brought Quarta for the same firm. Another built in 1885 for Belgium was Franco-Belge. All of these were large builds, one hundred and five feet in length with a beam of twenty one feet, and powered by fifty h.p. engines. Another of the same dimensions, Le Glorieux, was also built in this year for other Belgian owners. In May of 1887, this boat returned to Scotland, having been bought by Guybon Hutson of Glasgow, who sold the vessel on that same day to Muirhead Trawlers. Le Glorieux sank off Berwick on Tweed in September of 1895. The following is taken and translated from Le Genie Civil (Civil Engineer) of 1886. Belgian fishermen of Ostend had their first steam boat "Le Prima" built in Granton, Scotland. Their fleet expanded with the following ships: "Seconda", "Tertia", “Quarta", and "Franco-Belge". These ships were called "Steam Trawlers" and usually cost 125000 old francs and did 10 knots. Civil Engineer, 1886. A smaller vessel left the stocks in December of 1885. This was the eighty six foot Gran Canto for Spanish owners, the Mendzota Company. With a beam of seventeen feet, this trawler had a thirty five h.p. engine supplied by Hutson and Corbet of Glasgow. Another vessel of similar size, Degrave, was also built for Muirhead Trawlers in that year, although it is possible that it was sold straight on to Belgium. It is at this point that the trail goes cold. It is presumed that the boatyard was sold to Hawthorns and Company, who had a yard at Leith in the 1880s and had added a Granton one by the early 1890s. The reason for this sale is also unknown but by 1890, steel was taking over from wood as the popular hull material for trawlers. Unlike Hawthorns, Allan had not made the transition from wood to steel. Hawthorns also manufactured their own steam engines, whereas Allan's bought in from other firms, lessening their profit margins. These two factors probably combined to bring an end to one of the pioneering yards in steam fishing. To give an idea of how far ahead this firm was, Aberdeen, Scotland’s main fishing port at that time, did not build their first steam fishing vessel until 1883, some six years after David Allan. In just over a decade, the firm had left a lasting change on the European fishing industry, building what were probably Britain’s first steam trawlers and drifters, and then repeating this success in Italy, Spain, Belgium and France. However, like many innovators, they fell by the wayside and did not get the credit that they deserved. n.b. horse power ratings used throughout are nominal h.p. (n.h.p. to h.p. ratio is 1:6).